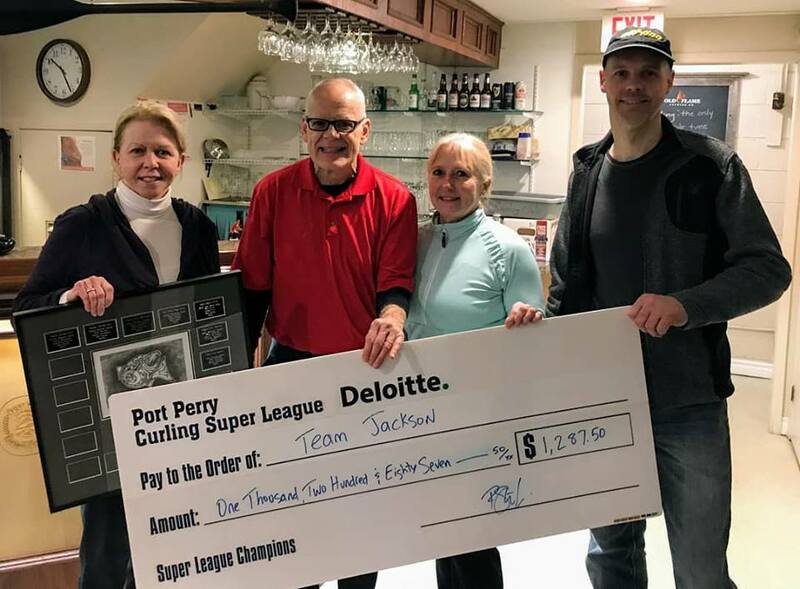 The 2019 Deloitte Super League came to a conclusion on March 28th, with Team Jackson becoming back to back Champions. The team consists of Carol Jackson, Rob Thompson, Deb Thompson and Ken Slute (who looks a like like Henk Klei in the picture below, great job sparing Henk!). Team Jackson defeated Super League newcomers Team Pioneer, consisting of Rob Larmer, Ian Soutar, Jamie Risebrough and Steve Ardron in a tight battle viewed by a great crowd of fellow members and family. Congratulations also to Ken Jeffrey for being nominated as the recipient of the annual Brian Van Camp Memorial Award. The recipient of this award best demonstrates all the great qualities exemplified by long time PPCC member and 2011 Super League Champion skip, Brian Van Camp. Lastly big thanks to Rob Steele for running another very successful season, and to Craig Harvey for his continued sponsorship through Deloitte. Located in Port Perry, Ontario, on the shores of Lake Scugog. The Club has been around since 1958 and for over 58 years we've developed into a facility that caters to the needs of our members, but most importantly the needs of our community. Our club offers a good balance between social and competitive curling, with the focus being on enjoying the game of curling and meeting some new friends. The Port Perry Curling Club offers many different leagues, so check out our League Information section on this site to find one that's right for you. The Port Perry Curling Club is also available for private rentals. We have a large banquet room on the main floor and a newly renovated lounge on the lower level. Check out our Club Rentals section for more information. Check us out today and... Good Curling everyone!